If you’re looking for a dishwasher which washes away the competition, then you would be hard pressed to find anything better than the Siemens SN66P150GB from their studioLine range. Features included are a wine glass holder, emotionLight, timeLight, varioSpeed Plus, and a very respectable A++ Energy Rating. 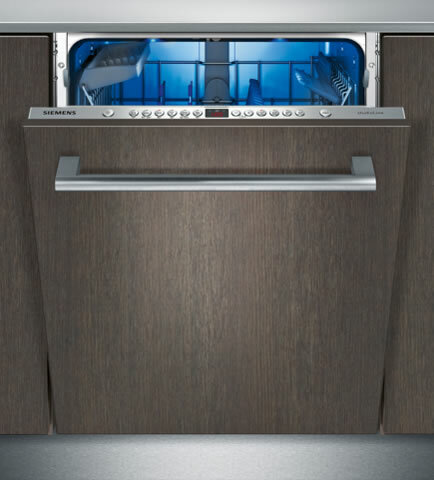 For purveyors of handless kitchens Siemens have been nice enough to include their doorOpen Assist technology. Simply press on the front of the unit, and the door smoothly opens with swan-like grace. Full hands, not a problem. A quick bump with your hips will have the same effect; incredibly handy when carrying multiple plates. At only 44 dB the SN66P150GB is also very quiet; so quiet in fact, you may have a hard time telling if it’s running a cycle. That’s where the ingenious timeLight comes into play. The idea with timeLight is the time remaining, along with a simple progress graph, is a projected directly onto the floor in front of the dishwasher. It’s a very futuristic feature, but one which has a true use without appearing tacky. We’ve always got studioLine appliances on show in our iQ Design Studio display in Hendon Central, where you can see this awesome feature in person. Green conscious? We hope so! This fully integrated dishwasher uses a mere 6.5 litres of water when running the Economy 50 programme. You’d be very hard pressed to achieve such a good result with such little water by hand, or with any other dishwasher in fact. At the end of the day, that is the purpose of efficient modern appliances. No disappointments here.